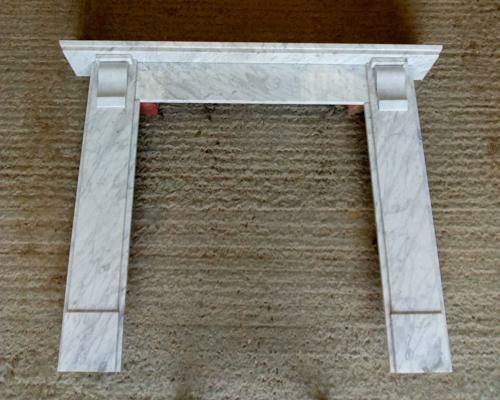 A pretty, reclaimed, modern carrara marble fire surround that is approximately 30 years old. The fire surround has an attractive colour and has a classic Victorian design with simple corbels and moulding around the mantel. The fire surround is ideal for use with a wood burner or to surround a hearth with fire basket. The fire is in a good, solid, and complete condition. The fire has a rebated edge that leaves a gap between the fire and the wall when fitted. The gap will need to be filled by purchaser, using either slate or plaster. The marble has a small chip, please see pictures for details. There are some small marks, scratches and small amounts of paint reside. The fire has a classic design that would suit both period or modern properties and is a desirable and quality item.